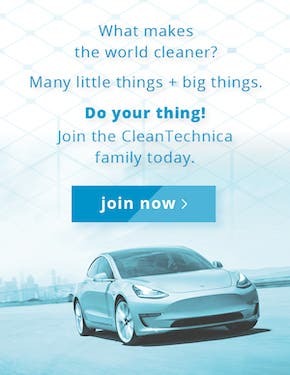 What Is The Optimum EV Range? We encourage you to complete this super brief survey before reading the article and looking at the results below. 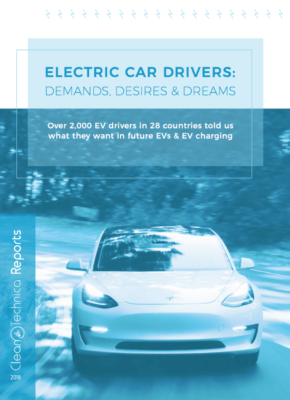 There is much discussion about the level of range needed for an electric vehicle to achieve longer journeys. The idea that an electric vehicle requires the same range as a liquid-fueled vehicle is arbitrary, and irrational. Filling a vehicle with liquid fuel is a time-consuming and expensive process, not altogether pleasant, which drivers wish to perform as seldom as possible. Filling a vehicle with electricity, on the other hand, is something as quick and convenient as plugging in your electric kettle at home. 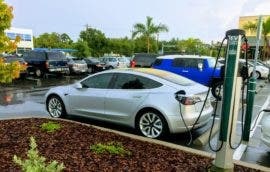 You do not have to stand next to your electric car while it is charging up: it manages to do this perfectly well all on its own. Most charging is done overnight, at home. For many, this range question only relates to longer journeys that require charging en-route. 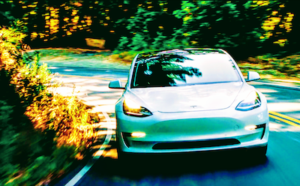 The principal that I am trying to establish is that the maximum range an electric vehicle requires is the distance a driver would travel before they stopped for a break, plus 20%. So, for example, a driver who would drive 100 miles before taking a break would need a maximum range in an electric vehicle of 120 miles. This principle is based on the simple idea that charging a vehicle on a journey should not make that journey any longer than it would be without such charging. 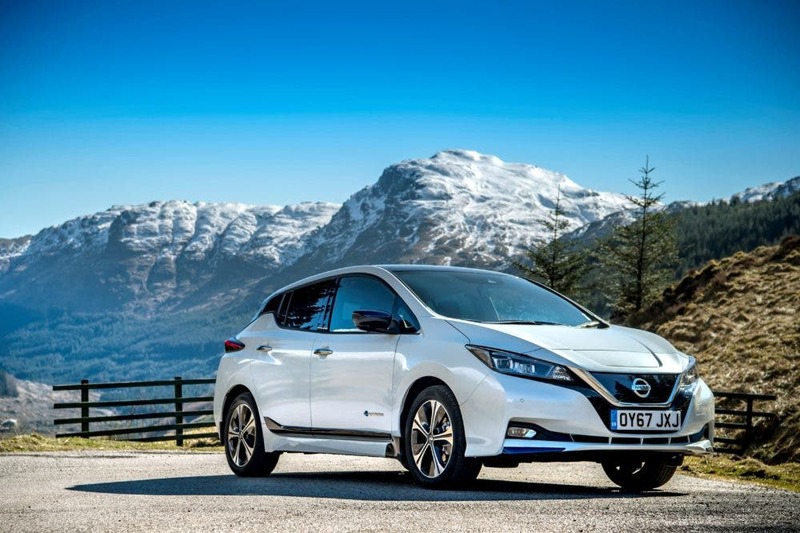 If a driver of an electric vehicle has to stop more often and has to stop for longer than a driver of a liquid-fuelled car, then that would be adding time to their journey. 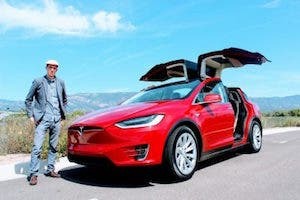 If a driver would normally stop after 100 miles for a rest in any case, then, when driving an electric vehicle, if they plug it into a charger after driving 100 miles, they have not lost any time. 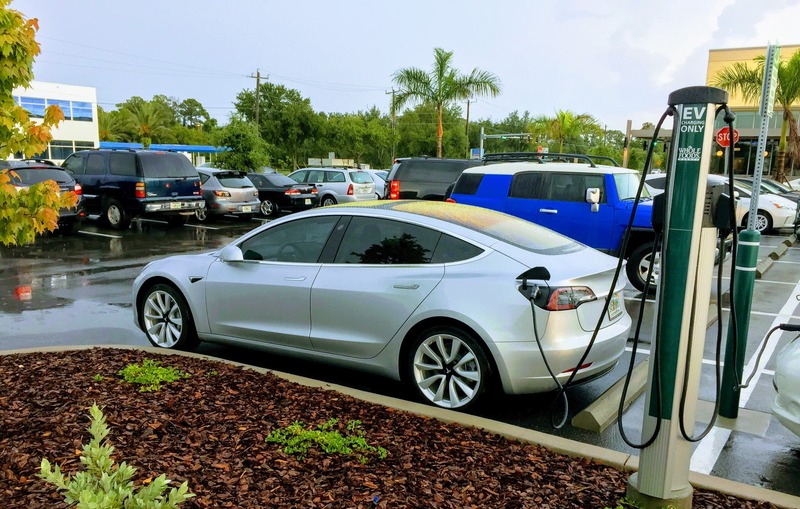 If they would normally stop for 25 minutes, and the electric vehicle takes 25 minutes to charge up, then, again, they have not lost any time. Therefore, electric vehicles with a range of 100 miles should be satisfactory for that driver. However, no driver of an electric vehicle wants to arrive at a charging station with no charge left, so a range of 100 miles would not be sufficient and we would need to add 20% to give them something in reserve. Also, the nature of charging is such that, when a battery is 80% full, to avoid damage to the battery, the charging current has to be considerably reduced. Using a fast charger, charging from, say, 20% up to 80%, is a fairly quick process (charging at up to 50 kW). After that, the charge level reduces to as little as 6 kilowatts, so takes much longer. 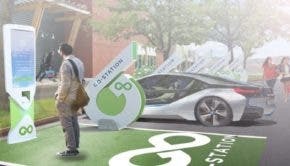 So, that is another reason for having at least 20% more than the 100 miles, because at the charging station, only 80% of charge will be easily achieved, and so only 80% of the full range will be available for the next leg of the journey. 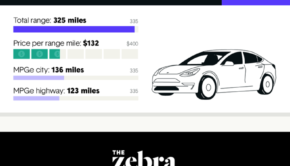 This leads to the conclusion that the maximum range an electric vehicle requires is somewhere between 120 miles and 140 miles if you are driving 100 miles between charges. This allows sufficient range on 80% of a full charge and also leaves something in reserve. 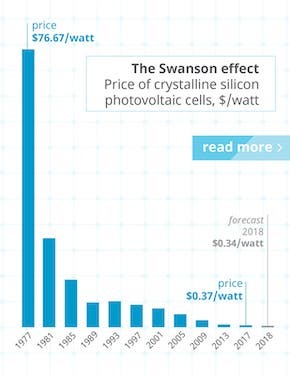 The battery in an electric vehicle is the heaviest and most expensive component of the car. For energy efficiency, it makes no sense to have a battery larger than necessary. It is an unfortunate and simplistic trait in some people to always equate bigger with better, and to think in this case, “my battery is bigger than your battery” as if that was a virtue. 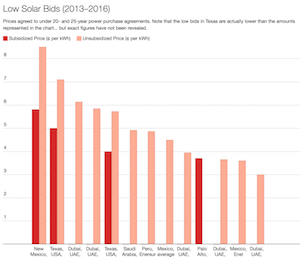 I tend to go along with the Bucky Fuller maxim that “more is less.” A smaller battery makes the price of the car less than it would have been. 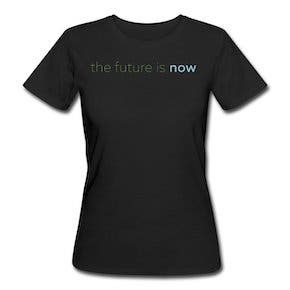 It also makes less weight to carry around, allowing improved performance and greater energy efficiency. That bigger battery, as well as wasting energy just to carry it around, will also cost more to replace. How Far Will People Drive Before Needing a Break? What we have discussed so far depends on a driver stopping approximately every 100 miles. In my case, I tend to stop about every 50 miles. The car I drive has a range of 70 miles, so it should be ideal for my driving pattern, but occasionally I find 70 miles is just a little bit too short to reach the next charging stop. I would be happier with a vehicle with a range of 90 miles, which was the claimed range for the vehicle when I bought it. Having discussed this with some people, they are very dismissive of my idea that drivers would normally stop after 100 miles. They say that, in their case, they would drive 200 miles just to get warmed up, and would then continue for another 100 miles before they stopped. I decided that the only way to settle this question was to conduct a survey. In this article, I am presenting the results of that survey. From the survey, I am able to give levels of range that would suit the majority of drivers. The survey was not quite as far-reaching as I had hoped, with most of the respondents coming from Europe. The reason for including a question about where people came from was that I thought perhaps people in North America might drive longer distances before stopping than those in Europe, where things are on a smaller scale. That assumption did not prove correct, as the respondents from North America chose driving times about the same as those from Europe, and, strangely, some of the longest distances before stopping were selected by a small minority from Europe. Combining those two as a group who would not drive any more than a hundred miles without taking a break, they account for 52.5% of respondents. The range requirement of more than half of all drivers is, therefore, only 120 miles. The respondents choosing 150 miles were 28.8%. 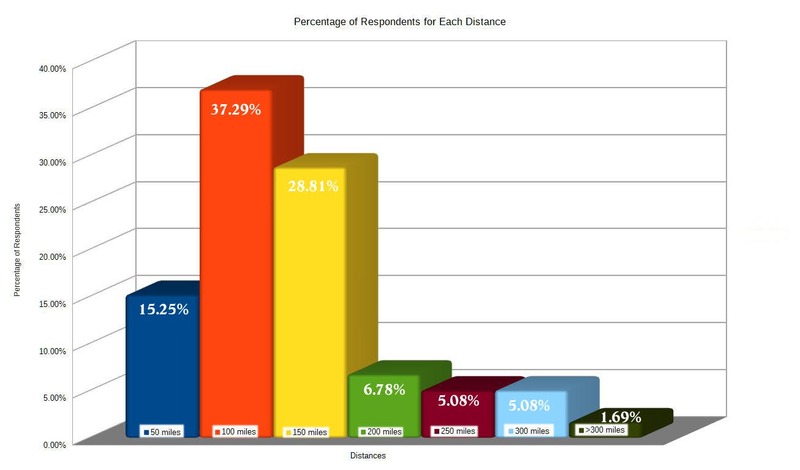 Combining them with the previous group creates a group of 81.4% of respondents who would stop after 150 miles or less. The remaining respondents are only 18.7% who would drive for more than 150 miles without stopping. The range requirement of more than 80% of all drivers is, therefore, only 180 miles, as 150 miles plus 20% is 180 miles. 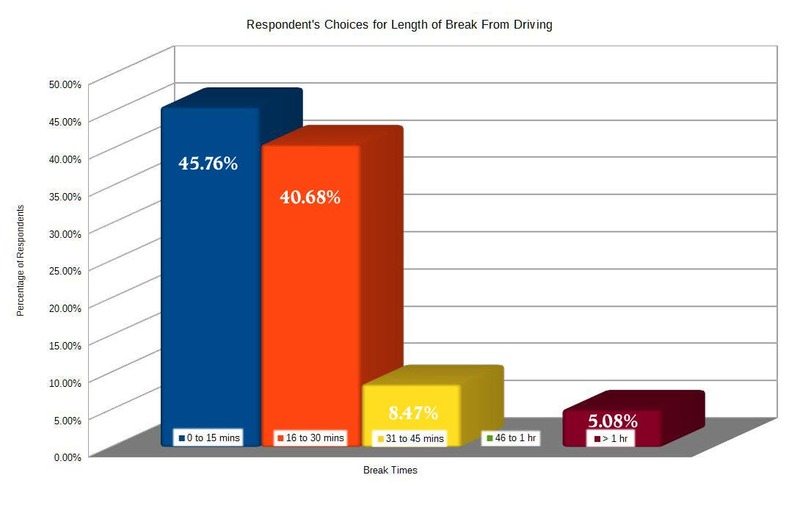 The number of respondents who selected up to 15 minutes as a time for a break was 45.8%. The number choosing between 16 and 30 minutes was 40.7%. With current charging times being between 20 and 30 minutes, 54.2% of people would find that an acceptable length of time, as it is about the time they would normally stop. 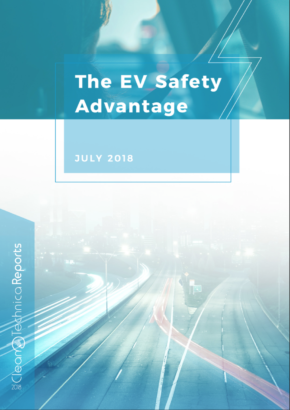 For the 45.8% who only want to stop for up to 15 minutes, the actual time to charge is not significantly more, and perhaps their requirements will be met by the 150kW and 350kW chargers planned for the near or eventual future. Going back to our original principal, 150 miles plus 20% is 180 miles. A large majority of people, therefore, require a range of no more than 180 miles in their electric vehicle. It is notable that the 2018 Nissan Leaf, which I drove in a recent test achieved a range of 185 miles on my journey, and that Nissan Leaf has a battery that is 40 kWh in size. 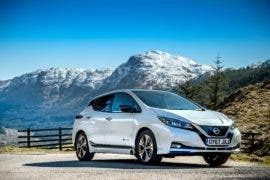 That being the case, it seems the vast majority of people require a battery size of no more than 40 kilowatt hours, and the Nissan Leaf would be an ideal family car for most people. For myself, I would enjoy a Hyundai Ioniq electric car, which is the most efficient car available. It has a range of 125 miles using a battery size of only 29 kilowatt-hours. I suspect from what drivers have said about it that it is quite capable of returning a range much greater than 125 miles. 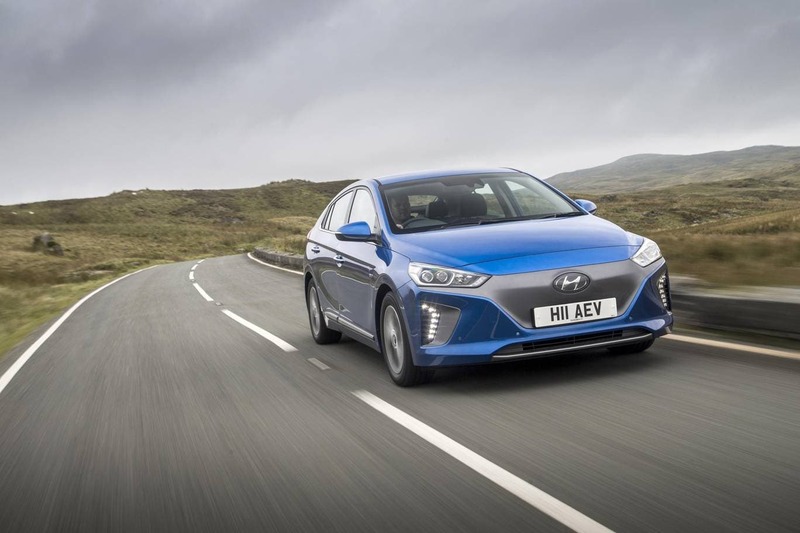 Next week I will be conducting a road test of the Hyundai Ioniq electric vehicle, so I will soon find out for myself and let you all know. For the minority of 18.7%, there are vehicles available with longer ranges. 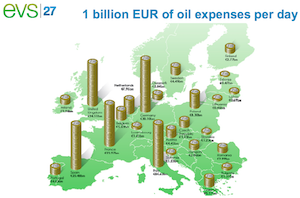 We, therefore, already have EVs with sufficient range for everyone (see table below). All that we lack, in some places, are the fast chargers on the highways, to allow people to stop every 100 miles in order to quickly charge up. In the UK, we have fast chargers at least every 30 miles on the motorways, and so are well catered for. The push, even in some parts of the UK, needs to be for more highway fast chargers to enable people to stop and charge wherever they would normally stop for a break. This would be more efficient than everyone carrying around an unnecessary weight of batteries, consuming megawatts of power more than they need to, just in case no one has bothered to put a fast charger where they need it.